Christmas is getting closer and closer and there’s less and less time to do your Christmas shopping. Tanya Burr and Zoe Sugg, are well known successful ladies and people I look up to in the blogging world. When I saw these gifts I was so excited and had to check them out immediately. They are the perfect gift for bloggers and fans and are an affordable price. At the moment on feelunique, you can purchase some of these gifts on 3 for 2, which is a bargain! Here’s a little look at some of the things you can purchase. 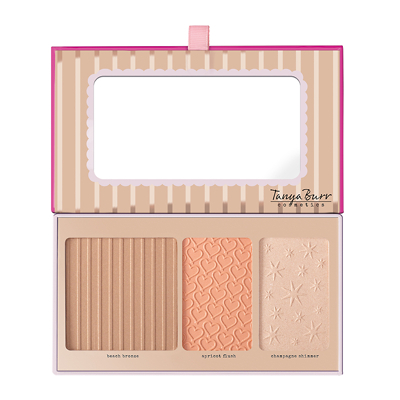 Starting off with Tanya Burr’s gift sets, I love her cheek pallet, which you can get in a peach tone and rose tone. I love how natural the colours look together, and the packaging looks luxurious. Another great gift is her nail polish, lip gloss and nail trio set. They come in Christmassy colours of gingerbread and candy cane. One thing I love about all these gift sets is the packaging, I love the colours and it would make anyone feel special, receiving one of these lovely sets. There’s a few other different gifts, so make sure you check them out on the website. Guaranteed these will be a sell out! Zoe is someone who inspired me to start blogging and then when I discovered Tanya, I found her very inspirational too. Zoe’s Christmas gifts are mainly bath related, so these would be perfect for a pampering treat for someone. One thing that has caught my eye is the trio of bath fizzers. The packaging is attractive and the product is affordable. I love how much product you get for the price. Another product of Zoe’s I like is her bath bombinis, which look like little disco balls. Again the packaging is cute, and would make a lovely gift, or why not just treat yourself? Has anyone purchased any of these gifts yet? Some of these products look absolutely gorgeous, I was in my local superdrug this week and practically half the shop is full of youtubers/bloggers products. Its so inspirational.